Usually with these GI Joe Comic Packs, you have to settle for getting one new figure with one you already have (or just plain didn't want). How nice, then, to find a pair where both figures are actually new to you! Deep Six never won any awards for being friendly. In fact, he became a Navy diver so that he could "be alone." He enjoys solitaire, bottle cap collecting, and the New York Times crossword puzzles. Only 12 out of 50 Navy divers passed the strict requirements for the coveted diver position on the Joe Team. Eight washed out in the practical application testing. Of the four finalists, Deep Six could hold his breath the longest. His unsociable behavior can be annoying (just ask Wild Bill), but when Cobra is on your back and you need a hand, Deep Six is there to help you out. Much more affable on the cartoon than in the comics, Deep Six is easily one of the most recognizable Joes. Come on, he wears a giant atmospheric diving suit at all times! He pops out of rivers, lakes and even swimming pools to delver lectures about water safety. What the hell was he doing in that pool, and why didn't anyone notice him? The original G1 Deep Six was easily the least articulated GI Joe figure ever released, with nothing but a swivel joint at each shoulder. This figure does its part to change that, but it's still a brick by G3 standards: his head is balljointed, but his shoulders and wrists are swivels, and his elbows are hinged. It's definitely not as poseable as the other modern Joes, but it's a step up from where he started. His suit has been completely resculpted, though it does look a lot like the original. 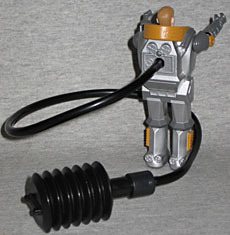 His only accessory is a bellows pump on a long plastic tube, which can plug into his back. Yes, just like the original figure, G3 Deep Six can be submerged in water, and made to float or sink as you wish. Before he enlisted in the Army, Ssgt. Rock 'n Roll was a surfer in Malibu, a weight lifter and a bass guitarist in local rock bands. Yet it was the life-saving actions of an Army Ranger that he witnessed on the beach as a boy which left a lasting impression and eventually led him to join the military. He thoroughly enjoys his job and jumps into each mission against Cobra forces with ferocious determination. He's familiar with all NATO and Warsaw Pact light and heavy machine guns. He graduated at the top of his class from Advanced Infantry Training and received specialized training at Covert Ops School. As one of the original 13 Joes, Rock N' Roll was mostly built from re-used pieces, just like his fellows. He, Breaker and Clutch all had the same head back then, for instance. But RnR did have the advantage of at least one unique piece: his chest. With two ammo belts strapped across him, he definitely stood out in the crowd. His update has the bandoliers, of course, but this time they're separate, removable pieces. Ah, progress! He also gets a big knife, and a giant machine gun and a string of bullets to feed through it. Rock 'n Roll got a single carded release at the same time as Torpedo and armored Cobra Commander, but this Comic Pack version has a few differences. He's swapped his brown boots for black, put on some camo pants, and rolled up his sleeves. One downside? Though he gets the new arms introduced for Tiger Force Flint, the watch sculpted on his left wrist hasn't been painted. Whoops. The facial sculpt is good, with Rock's beard looking particularly bushy. Remove his helmet, and you'll see his hair is surprisingly shaggy for a military man. While this figure has been renamed "SSgt. Rock 'n Roll" for trademark purposes, that's not quite right. Not only does his filecard list his grade as E-5, it also specifically says he came to the Joe team from the Army: while a SSgt. in the Air Force is an E-5, in the Army the grade is E-6; plus, while the Marines and Air Force abbreviate the rank as "SSgt. ", in the Army he'd be "SSG." Basically, the card makes him look like he's a flyboy, not a ground pounder. 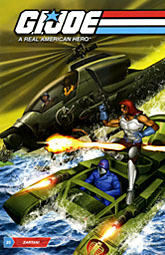 This set includes a reprint of GI Joe #25 with a new painted cover by Greg Horn and all internal references to Marvel removed. The comic features the first appearance of Deep Six (among others), but Rock 'n Roll's big scene is him wandering through one panel. Wow. If you like the story, the next part of it was reprinted a few years ago in Comic Pack #26, a good set in its own right. This updated version of Deep Six was originally included (in flatter, more cartoony colors) with the 2008 mass-market release of the SHARC, but since I already had the earlier Target-exclusive Night Specter, I passed. Nor was I particularly interesed in Rock 'n Roll by himself, so this comic pack was a perfect way to get both figures. RnR is a definite improvement over his single-card release, and the darker metallic colors used for Deep Six are nicer, too. These are both good Joes, so this set is a nice pairing.